Eleven years ago when my son was born a new world opened up to us. Having had a normal pregnancy, we were surprised when our son clearly had something going on. I remember asking, "Why isn't the baby crying?" and my husband assuring me that he just needed a little oxygen (he wasn't breathing, although years would go by before I knew that gem). I was a Science major in college with a special interest in Genetics. I had studied rare diseases, although what my son has is so rare, you wouldn't even look for it unless you knew about it. I had been a Special Education teacher and, now, here I was with a son with something medically worng, and I was at a loss. Earlier today playing on the iPad. In eleven years I have earned my medical degree, of sorts. I am more of an expert on Myotubular Myopathy than most doctors. I can stand on my two feet when it comes to carrying on a conversation laden with medical-ese. Although I never attended Med School, I feel like I can hang! Tonight has been one of those nights. My son can go from feeling good (remember it was just 24 hours ago I was talking about our kiss fests!) to not-so-good (like now...). A few hours can make a big difference for him. I can hear the difference between a ventilator that is working correctly or one that has a hose loose. Tidal Volume is the amount of air that he has pumped into his lungs with every breath. I can look at him and see if his oxygen saturation is ok (tonight...the grey dusky look, not a good one...saturation of 85...we want it in the mid-90's). I can hear if his lungs sound tight or he needs to be suctioned. I know by the smell of his breath if he is growing a respiratory bug (although my husband officially has the nickname "the nose," because he is right 95% of the time and usually knows a day earlier than I do). We have an oxygen concentrator, a pulse-oximeter, a ventilator, a suction machine, a humidifier, CPT machine, nebulizer, and a variety of other important medical equipment in our home. Right now I am typing for a bit, then checking to see how he looks and what his saturations are before coming back and typing. I have become a great listener for sounds (although I do have to turn the volume up on the TV because I can't hear...go figure! ), but they are specific sounds that are important in our house. Having child with medical needs can definitely change what you talk about sometimes (I had a whole other blog in mind about my grandfather, but that will wait for another time) but it is a constant reminder to really pay attention to your life (and in this case, his life too!). We don't know how long we will be blessed with his presence...I am hoping for 100 years, but who knows. I do know this...I love kissing him, especially when he is sick and so needs connections. I love rubbing his face and watching him fall asleep. I don't sleep as well as I used to. I have learned a lot of things that I never knew existed. I used to tell the hospital that they should have a frequent flier program that would include upgrades such as better foods, choice rooms with a good view (the helipad is the best, except for the diesel smell! ), and a more comfortable bed for the parent to sleep on. Needless to say they never implemented my program, but they would agree that after 11 years, I have my Mom MD. 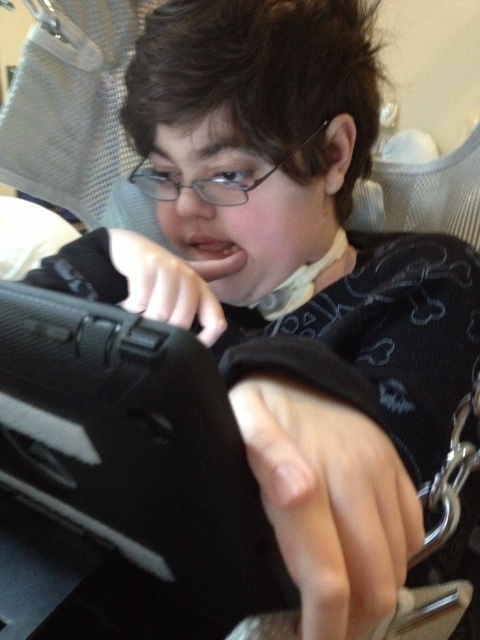 Shannon, Your posts about your son combine the honest concerns of a mom whose son has intense medical needs with the passionate love of a mom for her son. While I cannot imagine the challenges of your life, I can indeed feel the power of your love. Anita said it so much better than I ever could. I cannot imagine being a mom who loves her son so, so, so much, like all of us do, but then having to do the medical part of it too. And yeah, you probably could go head to head with most doctors. Hopefully your son is feeling better!